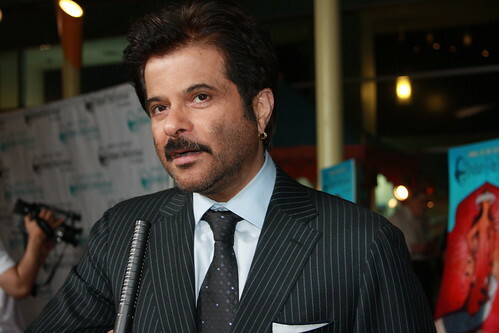 Anil Kapoor told me I have a “lovely smile.” My mother was pretty excited. And that says a lot. This 30-year Bollywood veteran is now the kind of star in America who draws attention on a red carpet in Hollywood. Kapoor made his international debut as the dubious host of India’s version of Who Wants to Be a Millionaire in Danny Boyle’s Slumdog Millionaire. In this, my second Global Lives podcast, I’m examining Kapoor’s take on “going global.” Since the success of Slumdog, he has found a willing international audience. He’s traveled with the film to the Golden Globes and the Oscars, and recently was cast in the eighth season of the Fox series 24. But Mr. Kapoor was thinking about the global film marketplace long before Slumdog‘s success. Last weekend at the Indian Film Festival of Los Angeles he debuted an English-language version of a Hindi film he produced called Gandhi, My Father. This episode of Global Lives was co-produced by Asia Pacific Arts, with insight and recordings from Ada Tseng. You can easily subscribe to this podcast or share it on your own blog or website. 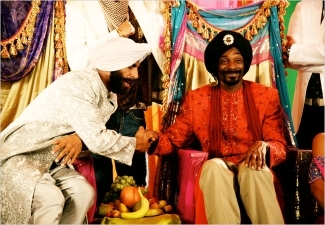 I hereby give Sita Sings the Blues to you. Like all culture, it belongs to you already, but I am making it explicit with a Creative Commons Attribution-Share Alike License. Please distribute, copy, share, archive, and show Sita Sings the Blues. From the shared culture it came, and back into the shared culture it goes. You don’t need my permission to copy, share, publish, archive, show, sell, broadcast, or remix Sita Sings the Blues. Certainly, Sita is a reflection on what shared culture means. Every faith seems to have “the virtuous woman,” the one who is exceedling pure and loyal and often makes great sacrifices for the sake of the family. In the Hindu epic the Ramayana, Sita is that kind of heroine, a paradigm of what womanhood and being a wife means. Her image is pervasive, and for those of us who have grown up both in and outside of Indian culture, it’s really problematic as well. She was the wife of Rama, an extremely popular king-deity, an incarnation of Vishnu, the perfect man and perfect son. Paley’s remix of the story, incorparting uncertainties, and simultaneously romanticizing and de-romanticizing Sita’s womanhood, is a breath of fresh air. And while Paley’s film and how she has released it raises a lot of big questions about film distribution in the digital age, it begs the larger question, who owns Sita’s story? Who gets to decide its lessons? You can download the film from the Sita Sings the Blues website, or even watch the whole thing on YouTube if you don’t mind the buffering. But there’s nothing like thinking about shared cultures in a space that represents shared culture. Catch it on a big screen if you can. All good things come to an end, and that is true today for myself and China Rises. This blog is taking a rest. At some point in the near future, a new McClatchy correspondent will arrive in China and likely take over this blog – certainly with a different perspective than my own. It’s been nearly three years since I started the China Rises blog, and my family is on its sixth year in China. English-language blogs on the Middle Kingdom have exploded in that time, and there’s a huge variety to read. In the land of news-meets-the-Internet, China has been fertile soil for very interesting blogs by journalists…Perhaps what is most interesting about these blogs is the opportunity to get a greater picture of reporters’ perspectives as foreigners living in a new country. But if the recession — and the seating arrangements at a G-20 summit dinner — tells us anything, it is that the West’s perception of the East is not all that counts. How emerging powerhouse economies see each other is of great importance, and lucky for us is incredibly interesting. An excellent entree into Asian takes on Asia is a Hindustan Times blog, Middle Order, written by the newspaper’s first China correspondent, Reshma Patil. Next up on the cross-culture China blog list: Double Handshake, written by Tom Pellman in Peru. I did a story about the documentary film Project Kashmir for Asia Pacific Arts. You can see the story and all of APA’s coverage of the San Francisco International Asian American Film Festival in their website. I also made my first attempt at making a podcast start-to-finish. I hope these will become more engaging as I keep practicing. I’m working on getting my buggy website to work with a player, so for now you can listen and subscribe directly from my site on mypodcast.com. UPDATE: It works now! Welcome to the first episode of Global Lives, a show about the kinds of people who make the whole world their home. Today, I’m talking to Senain Kheshgi and Geeta Patel, the filmmakers behind the much acclaimed documentary Project Kashmir. For more information about the film, visit projectkashmir.org. This episode is co-produced by the online magazine Asia Pacific Arts, asiaarts.ucla.edu. You can discover more Global Lives on my website, angileeshah.com. I’m pretty well acquainted with the airports of transportation hub city-states. The airports of Hong Kong and Singapore are well-designed places where travelers can keep living or working or holidaying, instead of just waiting. While I was living in Singapore, the proud little red dot unveiled its brand-new Changi Airport terminal, the enviable T3, where environmentally friendly vines cling to indoor walls and sculptures, waterfalls flow from architecturally integrated fountains, and brides and grooms gather to take advantage of the soft lighting for their wedding memories (no joke — I saw it with my own eyes and discovered later that the airport advertises itself as a wedding venue). I’ve made three trips through the spacious arrival and departure halls of the Hong Kong International Airport, where you get floor to ceiling views as planes taxi in and out against the backdrop of the island’s beautiful, rolling hills. Airports in Asia compete to be the most beautiful, the best for shopping, the grandest. But my layover in Hong Kong this time around — an eight-hour marathon of aimless walking and bottom-numbing musical chairs — reminds me that a) I can get pretty restless and b) the world is very connected. The flight boards show many cancellations today. Flights to or via Bangkok are all not coming or going. Flights to Mumbai are delayed. Travelers here watch the news and know people who are or were or might have been in these places, stuck or injured or worse. And its that sense of, “It could have been me,” on such a grand scale that makes geography almost irrelevent. I’m working on the first episodes of a podcast called “Global Lives” — this, I suppose, is one of the drawbacks to the otherwise exciting lives of people who consider the whole world their home. 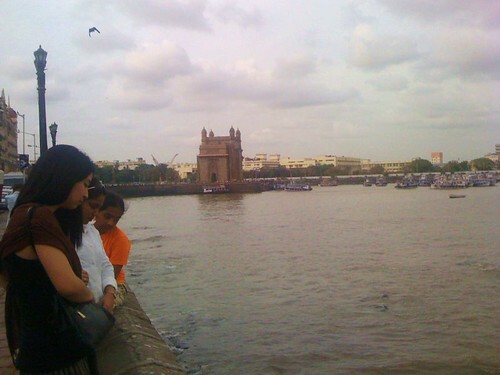 On my last visit to India in December, 2007, (correction) June, 2008, the Gateway of India in front, the Taj hotel just across the street. I spent maybe too much time this weekend reviving my rap playlist on iTunes. But it’s not my fault! To be fair, rappers are making pretty good news lately. I’ve been waiting for a hero to take on Fox News, and I’ve found one in the most unexpected of places. My favorite rapper #2, Nas, is taking Bill O’Reilly to task, and what’s even better is that he’s doing some of this very important work on really reputable new sources. And I thought this was enough for one weekend, enough to keep me busy looking for videos and awesome soundbites from both sides. Enough for me to start emailing friends links to my favorite Nas songs from YouTube. But two more unlikely combos are taking even more of my attention. And then, I find out that Ludacris is eating roti pratas. I can relate to one of the patrons of his new restaurant: “‘The roti is like crack,’ said Camille Wright, 36, the owner of a boutique in nearby Decatur, who was devouring the paper-thin pancakes with friends.